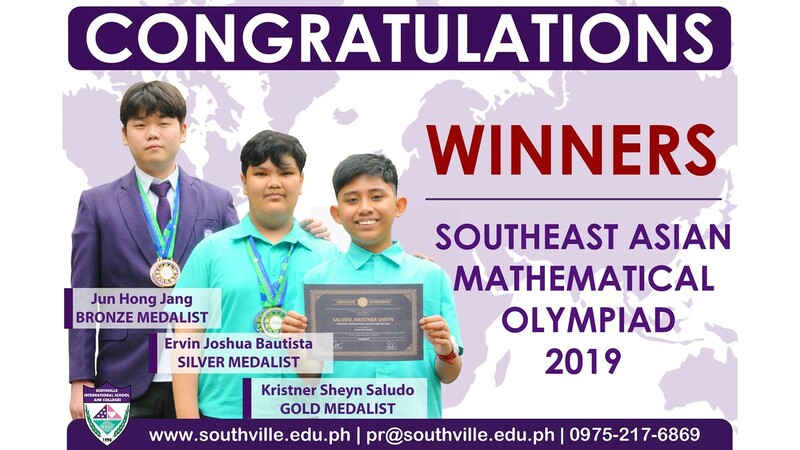 Mathletes from Southville International School and Colleges (SISC) took part and won a total of three medals at the 2019 Southeast Asian Mathematical Olympiad (SEAMO X) held in Singapore last January 19, 2019. Kristner Sheyn Saludo of Gr. 5 – Loyalty won a gold medal for placing in the top 0.025% of the participating students from Thailand, Myanmar, Laos, Cambodia, Vietnam, Malaysia, Indonesia, Singapore, Jakarta, Brunei, Timor-Leste and the Philippines. Ervin Joshua Bautista of Gr. 6 – Perseverance, on the other hand, gained a silver medal for belonging in the next 1% while Jun Hong Jang of Gr. 12 – Grit earned a bronze medal for placing in the next 2%. The SEAMO gathers the brightest mathematics students from Southeast Asian countries and tests their mathematical creativity and problem-solving capabilities.